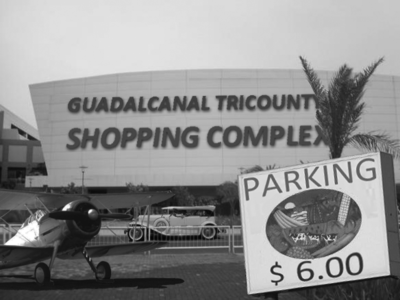 The Guadalcanal Tricounty Shopping Complex during Japanese occupation. For those without comedic tastes, the so-called experts at Wikipedia have an article about Battle of Guadalcanal. The Battle of Guadalcanal was a critical engagement between American and Japanese forces in the Pacific Theater of World War II. Conducted at the Guadalcanal Tricounty Shopping Complex (GTSC) and in nearby strip malls, the battle was a turning point in the struggle for control of the Solomon Islands, a strategic outpost for military operations and home of fine bargains on locally produced coconut-fiber goods. The United States' military victory at Guadalcanal gave its army a firm foothold in the Pacific and enabled its soldiers to avail of numerous sales and Double Coupon Days. After a string of victories – including the Siege of SM Megamall in Manila, the Invasion of Singapore Outlets and the seizing of North Borneo's Krazy Kommercial Komplex – the Japanese were steadily building a footpath across the ocean. Relying on poor intelligence, the US military failed to make an advance on Guadalcanal until the Japanese were already occupying the GTSC's east wing, food court and several pricy fashion boutiques. When the Americans invaded the complex on August 7, 1942, they were up against an entrenched, well-fed and totally fabulous enemy force. Surprisingly, the Japanese failed to capitalize on their superior position. When the Americans initially landed in the nearby Tulagi Town strip mall, Japanese forces provided almost no resistance. This allowed the Allied forces to establish a base for further operations. After several days the American GIs had built fortifications, ammunition depots and a supply line to the nearest Chik-Fil-A fast food restaurant. However, attempts to reconnoiter Japanese troop movements largely failed; immediately after their occupation started, the Japanese reduced mall hours to 10am-2pm and began charging for parking. With the reduction in mall patrons, American spies were easy to spot. American officials soon felt that it was time to move in on the Tricounty Shopping Complex. Aside from the fact that low public morale in the United States demanded a military victory, the GTSC was the only retailer of GI fatigues east of Hong Kong, and troops were beginning to complain of frayed cuffs and unsightly runs. On August 12, an American force of several hundred approached the mall from the north and, stymied by a large and well-organized mall blood drive, were forced to enter via the less popular west entrance, which housed farming supply outlets and a Hot Topic. They were met with surprisingly little resistance and, minus three grunts who abandoned their positions to check out the arcade, soon established their own outpost in the west wing. Once settled, American troops were in little hurry to provoke the Japanese; the American side of the mall had superior candy machines, and – unbeknownst to the Japanese – the US forces had sent a small crack team of specialists to infiltrate the east wing. Any major movement may have put the Japanese on high alert, so the Americans stayed settled. They spent the next three days running drills, washing their uniforms in the mall fountain and polishing the faux-marble floors so they could slide across them in socks. Japanese-held areas in yellow, American-held in blue. Arrows show American troop movements. 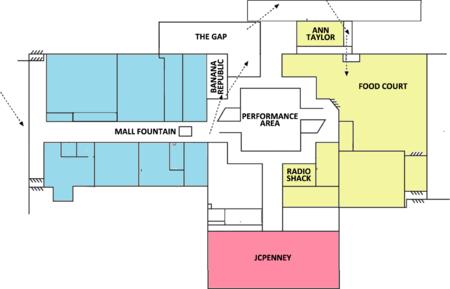 JCPenney, in the south wing, was held by an independent coalition of thrifty mothers and considered too dangerous to engage. The American specialist task force included leader Barnes N. Noble, a sniper; codebreaker Eddie Bauer; and mall survival expert Lawrence “Brook” Stone. These men were tasked with reporting on Japanese troop positions and procuring a ration of Auntie Anne's cinnamon pretzels. The trio proceeded to the central mall atrium, where they hit their first snag. An unidentified mall guard demanded they surrender their automatic weapons. Noble was initially furious at the intrusion and claimed that the mall employee was jeopardizing the security of the free world, but the guard pointed out that the rules were clearly posted both inside and outside the mall. Noble had to reluctantly concede the point. The men received chits and were told they could recover their weapons at the central mall office upon their exit. They were allowed to keep their grenades, provided they were kept in clear plastic bags. Their next stop was Banana Republic, which was having a sale on slacks. Noble bought three pairs. Stone was irritated to find that the store did not carry wide sizes and had a minor altercation with a bespectacled clerk. Bauer had forgotten his wallet. The men next faced “The Gap,” the most dangerous portion of their trek. The Gap was a wide expanse of overpriced polos and listlessly zealous twentysomethings. An early report about The Gap had indicated the possibility of landmines hidden in the pockets of discount skinny jeans, although this report may have been a misinterpretation of the store's claim to offer “Explosive Savings.” The task force remained on high alert, but managed to negotiate The Gap without any more serious incident than Stone applying for a loyalty card. Their destination was the backroom complex connecting many of the mall's stores. The men slipped through an unmarked door in the rear of The Gap, negotiated the tables of young children gluing together luxury sunglasses, and after a short march found themselves right outside the mall's Honiara Food Court. The mission ended in tragedy. Caught short on cash while ordering at Johnny Rocket's, Noble was gunned down by a Japanese grunt dressed as a busboy after offering to pay with American Express. The bodies of the three men were later displayed by the Japanese at the mall's performance area. Both of Noble's Paneras had been mangled, and Stone's Sbarro had been cut off and stuffed into his own mouth. Bauer's many gaping wounds still dripped Border Sauce. After the failure of the crack force, the American leadership determined that the key to conquering the mall was the strategically-located Radio Shack. In addition to providing a convenient location from which to launch further operations, Radio Shack itself was stocked with electronics equipment that the Americans could use to repair faulty radio gear, and batteries with which to power their Game Boys. The battle was easily won by the Americans because the Japanese were all hanging out in the Apple Store, videochatting with Tojo. Old Navy Performance Fleece: protects you from inclement weather and Japanese attacks. Soon, the Americans had relegated the Japanese to a single Ann Taylor store, and success seemed imminent. However, reinforcements sent from a standalone Japanese-held GNC outlet soon resulted in a bloody, drawn-out battle for ultimate control of the Solomons. This force attacked suddenly, ferociously and nutritiously. The Americans, thrown into disarray, suffered heavy casualties before being able to mount a response. Without reliable air cover, they were forced to rely on their untested seagoing forces: the Old Navy. This turned out to be a fortunate match-up for the United States, as the Old Navy's heavy cargoes and fleece hoodies easily absorbed the vitamin bombs lobbed by the Japanese. After losing nearly one-third of their numbers, the Japanese managed to board a key American destroyer. This Japanese hand-to-hand combat force, the J. Crew, was known and feared throughout the Pacific for their bloodthirstiness and $600 outerwear, and many American crew members simply leapt into the ocean rather than face their adversaries. The Japanese were discounted but not yet bargain-binned. The Americans owe their victory in the Old Naval Battle of Guadalcanal to a freak accident. The GNC-based Japanese were regaining the upper hand when a salvo of 2-for-1 pocket squares from an American gunnery ignited a store of protein powder held in the hold of a Japanese ship. The powder erupted, ripping the vessel apart. Several nearby ships were set on fire by flaming cod liver oil spewing from the wreckage. Cheers went up from the American forces: the long fight for Guadalcanal was over. Guadalcanal was not only a military victory for the Americans, it was a sign to citizens back home that the war in the Pacific could still be won. And indeed, Guadalcanal marked the beginning of a long Allied march across the Pacific, reclaiming commercial centers for the stars and stripes. On August 6, 1945, the United States dropped an atomic bomb on Tokyo's Shibuya 109 shopping complex, and three days later a similar bomb obliterated the Roppongi Hills shopping mall. Faced with this destruction, Japan soon surrendered to the Allies. World War II was over. Guadalcanal itself continued to function as a supplier for the American forces during the war. L.L. Bean and American Eagle clothing stores were converted to provide military uniforms, the mall food suppliers began feeding the men at the front, and troops got great discounts on sensible Payless shoes. This page was last edited on 3 July 2012, at 02:30.